This week, one man broke a world record that might make you squirm: beekeeper, Gao Bingguo, beat the "Carrying the Flag" World Record for wearing the heaviest weight of bees on his body. That’s right—live bees—on his mostly-bare body. Early Monday morning before the sun came up, beekeepers in China’s Shandong province coated Bingguo’s skin with honey to attract queen bees, who then attracted more than one million worker bees weighing 240 pounds, the Associated Press reports. The flying, stinging creatures covered almost all of his body. To make it easier to breathe, Gao, 55, smoked a cigarette to prevent them from covering his mouth and nose. When he was done, Gao stood up and shook the bees from his body, and was helped into a hot bath to soothe the many stings he had sustained. Watch the video above to see — and hear — the record being broken. A beekeeper in China has broken the world record for carrying the heaviest weight of bees on a human body. 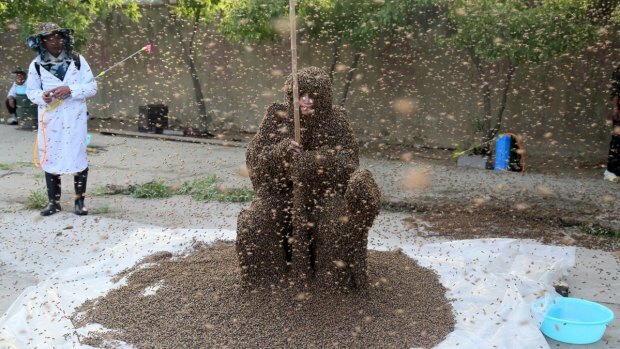 Gao Bingguo covered himself in more than 1 million bees, weighing 240 pounds. The feat was followed by a ceremony with the London-based "Carrying the Flag" World Records organization. Last year, Gao tried the stunt but only attracted about 326,000 bees on his body.